The Star workstation, officially named Xerox 8010 Information System, was the first commercial system to incorporate various technologies that have since become standard in personal computers, including a bitmapped display, a window-based graphical user interface, icons, folders, mouse (two-button), Ethernet networking, file servers, print servers, and e-mail. Introduced by Xerox Corporation on April 27, 1981, the name Star technically refers only to the software sold with the system for the office automation market. The 8010 workstations were also sold with software based on the programming languages Lisp and Smalltalk, for the smaller research and software development market. The Xerox Star systems concept owes much to the Xerox Alto, an experimental workstation designed by the Xerox Palo Alto Research Center (PARC). The first Alto became operational in 1972. At first, only a few Altos were built. Although by 1979 nearly 1,000 Ethernet-linked Altos were in use at Xerox and another 500 at collaborating universities and government offices, it was never intended to be a commercial product. While Xerox had started in 1977 a development project which worked to incorporate those innovations into a commercial product, their concept was an integrated document preparation system, centered around the (then expensive) laser printing technology and oriented towards large corporations and their trading partners. When that system was announced in 1981, the cost was about $75,000 ($207,000 in today's dollars) for a basic system, and $16,000 ($44,000 today) for each added workstation. The Star was developed at Xerox's Systems Development Department (SDD) in El Segundo, California, which had been established in 1977 under the direction of Don Massaro. A section of SDD, SDD North, was located in Palo Alto, California, and included some people borrowed from PARC. SDD's mission was to design the "Office of the future", a new system that would incorporate the best features of the Alto, was easy to use, and could automate many office tasks. The development team was headed by David Liddle, and would eventually grow to more than 200 developers. A good part of the first year was taken up by meetings and planning, the result of which was an extensive and detailed functional specification, internally termed the "Red Book". This became the bible for all development tasks. It defined the interface and enforced consistency in all modules and tasks. All changes to the functional specification had to be approved by a review team which maintained standards rigorously. One group in Palo Alto worked on the underlying operating system interface to the hardware and programming tools. Teams in El Segundo and Palo Alto collaborated on developing the user interface and user applications. The staff relied heavily on the technologies they were working on, file sharing, print servers and e-mail. They were even connected to the Internet, then named Arpanet, which helped them communicate between El Segundo and Palo Alto. The Star was implemented in the programming language Mesa, a direct precursor to Modula-2 and Modula-3. Mesa was not object-oriented, but tools and programming techniques were developed which allowed pseudo object-oriented design and programming. Mesa required creating two files for every module. A definition module specified data structures and procedures for each object, and one or more implementation modules contained the code for the procedures. The Star team used a sophisticated integrated development environment (IDE), named internally Tajo and externally Xerox Development Environment (XDE). Tajo had many similarities with the Smalltalk-80 environment, but it had many added tools. For example, the version control system DF, which required programmers to check out modules before they could be changed. Any change in a module which would force changes in dependent modules were closely tracked and documented. Changes to lower level modules required various levels of approval. The software development process was intense. It involved much prototyping and user testing. The software engineers had to develop new network communications protocols and data-encoding schemes when those used in PARC's research environment proved inadequate. Initially, all development was done on Alto workstations. These were not well suited to the extreme burdens placed by the software. Even the processor intended for the product proved inadequate and involved a last minute hardware redesign. Many software redesigns, rewrites, and late additions had to be made, variously based on results from user testing, and marketing and systems considerations. A Japanese language version of the system was produced in conjunction with Fuji Xerox, code named J-Star, and full support for international customers. In the end, many features from the Star Functional Specification were not implemented. The product had to get to market, and the last several months before release focused on reliability and performance. The key philosophy of the user interface was to mimic the office paradigm as much as possible in order to make it intuitive for users. The concept of what you see is what you get (WYSIWYG) was considered paramount. Text would be displayed as black on a white background, just like paper, and the printer would replicate the screen using Interpress, a page description language developed at PARC. One of the main designers of the Star, Dr. David Canfield Smith, invented the concept of computer icons and the desktop metaphor, in which the user would see a desktop that contained documents and folders, with different icons representing different types of documents. Clicking any icon would open a window. Users would not start programs first (e.g., a text editor, graphics program or spreadsheet software), they would simply open the file and the appropriate application would appear. The Star user interface was based on the concept of objects. For example, a word processing document would hold page objects, paragraph objects, sentence objects, word objects, and character objects. The user could select objects by clicking on them with the mouse, and press dedicated special keys on the keyboard to invoke standard object functions (open, delete, copy, move) in a uniform way. There was also a "Show Properties" key used to display settings, called property sheets, for the particular object (e.g., font size for a character object). These general conventions greatly simplified the menu structure of all the programs. Object integration was designed into the system from the start. For example, a chart object created in the graphing module could be inserted into any type of document. This type of ability eventually became available as part of the operating system on the Apple Lisa and was featured in Mac OS System 7 as Publish and Subscribe. It became available on Microsoft Windows with the introduction of Object Linking and Embedding (OLE) in 1990. This approach was also later used on the OpenDoc software platform in the mid-to-late 1990s, and in the AppleWorks (originally ClarisWorks) package available for the Apple Mac (1991) and Microsoft Windows (1993). Initially, the Star software was to run on a new series of virtual-memory processors, described in a PARC technical report called, "Wildflower: An Architecture for a Personal Computer", by Butler Lampson. The machines had names that always began with the letter D. They were all microprogrammed processors; for the Star software, the microcode implemented an instruction set designed for Mesa. The first of these machines was the Dolphin, built with transistor-transistor logic (TTL) technology, including 74S181 ALUs. The complexity of the software eventually overwhelmed its limited configuration. At one time in Star's development, it took more than half an hour to reboot the system. The base Dandelion system had 384 kB memory (expandable to 1.5 MB), a 10 MB, 29 MB or 40 MB 8" hard drive, an 8" floppy drive, mouse and an Ethernet connection. The performance of this machine, which sold for $20,000, was about 850 in the Dhrystone benchmark — comparable to that of a VAX-11/750, which cost five times more. The 17 inches (43 cm) cathode ray tube (CRT) display (black and white, 1024×809 pixels with 38.7 Hz refresh) was large by the time's standards. It was meant to be able to display two 8.5×11 in pages side by side in true size. An interesting feature of the display was that the overscan area (borders) could be programmed with a 16×16 pattern. This was used to extend the root window pattern to all the edges of the monitor, a feature that is unavailable even today on most video cards. The next design, the Dorado, used an emitter coupled logic (ECL) processor. It was four times faster than Dandelion on standard benchmarks, and thus competitive with the fastest super minicomputers of the day. It was used for research but was a rack-mounted CPU that was never intended to be an office product. A network router called Dicentra was also based on this design. The Xerox Star was not originally meant to be a stand-alone computer, but to be part of an integrated Xerox "personal office system" that also connected to other workstations and network services via Ethernet. Although a single unit sold for $16,000, a typical office would need to buy at least 2 or 3 machines along with a file server and a name server/print server. Spending $50,000 to $100,000 for a complete installation was not an easy sell, when a secretary's annual salary was about $12,000 and a Commodore VIC-20 cost around $300. Later incarnations of the Star would allow users to buy one unit with a laser printer, but even so, only about 25,000 units were sold, leading many to consider the Xerox Star a commercial failure. The workstation was originally designed to run the Star software for performing office tasks, but it was also sold with different software for other markets. These other configurations included a workstation for Interlisp or Smalltalk, and a server. Some have said that the Star was ahead of its time, that few outside of a small circle of developers really understood the potential of the system, considering that IBM introduced their 8088-based IBM PC running the comparatively primitive PC DOS the same year that the Star was brought to market. However, comparison with the IBM PC may be irrelevant: well before it was launched, buyers in the Word Processing industry were aware of the 8086-based IBM Displaywriter, the full-page portrait black-on-white Xerox 860 page display system and the 120 page-per-minute Xerox 9700 laser printer. Furthermore, the design principles of Smalltalk and modeless working had been extensively discussed in the August 1981 issue of Byte magazine, so Xerox PARC's standing and the potential of the Star can scarcely have been lost on its target (office systems) market, who would never have expected IBM to position a mass-market PC to threaten far more profitable dedicated WP systems. Unfortunately, the influential niche market of pioneering players in electronic publishing such as Longman were already aligning their production processes towards generic markup languages such as SGML (forerunner of HTML and XML) whereby authors using inexpensive offline systems could describe document structure, making their manuscripts ready for transfer to computer to film systems that offered far higher resolution than the then maximum of 360 dpi laser printing technologies. Another possible reason given for the lack of success of the Star was Xerox's corporate structure. A longtime copier company, Xerox played to their strengths. They already had one significant failure in making their acquisition of Scientific Data Systems pay off. It is said that there were internal jealousies between the old line copier systems divisions that were responsible for bulk of Xerox's revenues and the new upstart division. Their marketing efforts were seen by some as half-hearted or unfocused. Furthermore, the most technically savvy sales representatives that might have sold office automation equipment were paid large commissions on leases of laser printer equipment costing up to a half-million dollars. No commission structure for decentralized systems could compete. The multi-lingual technical documentation market was also a major opportunity, but this needed cross-border collaboration for which few sales organisations were ready at the time. Even within Xerox Corporation, in the mid-1980s, there was little understanding of the system. Few corporate executives ever saw or used the system, and the sales teams, if they requested a computer to assist with their planning, would instead receive older, CP/M-based Xerox 820 or 820-II systems. There was no effort to seed the 8010/8012 Star systems within Xerox Corporation. Probably most significantly, strategic planners at the Xerox Systems Group (XSG) felt that they could not compete against other workstation makers such as Apollo Computer or Symbolics. The Xerox name alone was considered their greatest asset, but it did not produce customers. Finally, by today's standards, the system would be considered very slow, due partly to the limited hardware of the time, and partly to a poorly implemented file system; saving a large file could take minutes. Crashes could be followed by an hours-long process called file scavenging, signaled by the appearance of the diagnostic code 7511 in the top left corner of the screen. In the end, the Star's weak commercial reception probably came down to price, performance in demonstrations, and weakness of sales channels. Even then Apple Computer's Lisa, inspired by the Star and introduced 2 years later, was a market failure, for many of the same reasons as the Star. To credit Xerox, they did try many things to try to improve sales. The next release of Star was on a different, more efficient hardware platform, Daybreak, using a new, faster processor, and accompanied by significant rewriting of the Star software, renamed ViewPoint, to improve performance. The new system, dubbed the Xerox 6085 PCS, was released in 1985. The new hardware provided 1 MB to 4 MB of memory, a 10 MB to 80 MB hard disk, a 15" or 19" display, a 5.25" floppy drive, a mouse, Ethernet connection and a price of a little over $6,000. The Xerox 6085 could be sold along with an attached laser printer as a standalone system. Also offered was a PC compatibility mode via an 80186-based expansion board. Users could transfer files between the ViewPoint system and PC-based software, albeit with some difficulty because the file formats were incompatible with any on the PC. But even with a significantly lower price, it was still a Rolls Royce in the world of lower cost $2,000 personal computers. In 1989, Viewpoint 2.0 introduced many new applications related to desktop publishing. Eventually, Xerox jettisoned the integrated hardware/software workstation offered by Viewpoint and offered a software-only product called GlobalView, providing the Star interface and technology on an IBM PC compatible platform. The initial release required installing a Mesa CPU add-on board. The final release of GlobalView 2.1 ran as an emulator on Sun Solaris, Microsoft Windows 3.1, Windows 95, or Windows 98, IBM OS/2 and was released in 1996. In the end, Xerox PARC, which prided itself upon building hardware 10 years ahead of its time and equipping each researcher with the hardware so they could get started on the software, enabled Xerox to bring the product to market 5 years too early, all throughout the 1980s and into the early 1990s. The custom-hardware platform was always too expensive for the mission for which Star/Viewpoint was intended. Apple, having copied the Xerox Star in the early 1980s with Lisa, struggled and had the same poor results. Apple's second, cost-reduced effort, the Macintosh, barely succeeded (by ditching the virtual memory, implementing it in software, and using commodity microprocessors) - and was not their most profitable product in the late 1980s. Apple also struggled to make profits on office system software in the same time period. L Peter Deutsch, one of the pioneers of the Postscript language, finally found a way to achieve Xerox-Star-like efficiency using just-in-time compilation in the early 1990s for bitmap operations, making the last bit of Xerox-Star custom hardware, the BitBLT, obsolete by 1990. Even though the Star product failed in the market, it raised expectations and laid important groundwork for later computers. Many of the innovations behind the Star, such as WYSIWYG editing, Ethernet, and network services such as directory, print, file, and internetwork routing have become commonplace in computers of today. Members of the Apple Lisa engineering team saw Star at its introduction at the National Computer Conference (NCC '81) and returned to Cupertino where they converted their desktop manager to an icon-based interface modeled on the Star. Among the developers of Xerox's Gypsy WYSIWYG editor, Larry Tesler left Xerox to join Apple in 1980 where he also developed the MacApp framework. Charles Simonyi left Xerox to join Microsoft in 1981 where he developed first WYSIWYG version of Microsoft Word (3.0) and beyond, and several other defectors from PARC followed Simonyi to Microsoft in 1983. Star, Viewpoint and GlobalView were the first commercial computing environments to offer support for most natural languages, including full-featured word processing, leading to their adoption by the Voice of America, other United States foreign affairs agencies, and several multinational corporations. 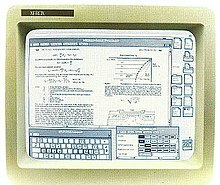 The list of products that were inspired or influenced by the user interface of the Star, and to a lesser extent the Alto, include the Apple Lisa and Macintosh, Graphics Environment Manager (GEM) from Digital Research (the CP/M company), Microsoft Windows, Atari ST, BTRON from TRON Project, Commodore's Amiga, Elixir Desktop, Metaphor Computer Systems, Interleaf, IBM OS/2, OPEN LOOK (co-developed by Xerox), SunView, KDE, Ventura Publisher, and NEXTSTEP. Adobe Systems PostScript was based on Interpress. Ethernet was further refined by 3Com, and has become a de facto standard networking protocol. Some people, like Dominic Connor, feel that Apple, Microsoft, and others plagiarized the GUI and other innovations from the Xerox Star, and believe that Xerox didn't properly protect its intellectual property. The truth is more complex, perhaps. Many patent disclosures were submitted for the innovations in the Star. However, at the time, the 1975 Xerox Consent Decree, a Federal Trade Commission (FTC) antitrust action, placed restrictions on what the firm was able to patent. Also, when the Star disclosures were being prepared, the Xerox patent attorneys were busy with several other new technologies such as laser printing. Finally, patents on software, particularly those relating to user interfaces, were then an untested legal area. On January 15, 2019, a work-in-progress Xerox Star emulator created by LCM+L known as Darkstar was released for Windows and Linux. ^ Smith, D.; Irby, C.; Kimball, R.; Verplank, B.; Harslem, E. (1982). "Designing the Star User Interface". Byte. 7 (2): 242–282. ^ a b "PARC Milestones". Retrieved November 13, 2008. ^ Douglas K. Smith; Robert C. Alexander (1988). Fumbling the Future: How Xerox Invented, Then Ignored, the First Personal Computer. New York: William Morrow. ISBN 0-688-06959-2. ^ Niklaus Wirth (January 1995). "A Brief History of Modula and Lilith". The ModulaTor Oberon-2 and Modula-2 Technical Publication. modulaware.com. ^ Lieberman, Henry. "A Creative Programming Environment, Remixed". Cambridge: MIT Media Lab. CiteSeerX 10.1.1.125.4685. ^ Salha, Nader. "Aesthetics and Art in the Early Development of Human-Computer Interfaces", October 2012. ^ Smith, David. "Pygmalion: A Creative Programming Environment", 1975. ^ Pier, Kenneth A. (1983). "A retrospective on the Dorado, a high-performance personal computer" (PDF). Proceedings of the 10th Annual International Symposium on Computer Architecture. Retrieved January 26, 2019. ^ Norman, Donald A. (1999). The Invisible Computer. Cambridge, Massachusetts: MIT Press. p. 316. ISBN 978-0-262-64041-1. ^ IBM's launch presentation (at 103 Wigmore St London in September 1980) claimed the Displaywriter used three 8086 chips, though 1x8086 + 2x8088 seems more credible. ^ Dan Ingalls (August 1981). "Design Principles Behind Smalltalk". Byte magazine. McGraw-Hill. Archived from the original on September 27, 2007. ^ "An Interview with Wayne Rosing, Bruce Daniels, and Larry Tesler". Byte. Retrieved 2007-02-08. ^ "Weird Processing: The Collision of Computers and Cultures at the Voice of America 2007". Chris Kern's Eponymous Web Site. Retrieved 2007-12-01. ^ "Xerox Star Research". John Redant. Retrieved 2007-02-08. ^ "The 1975 Xerox Consent Decree: Ancient Artifacts and Current Tensions" (PDF). Willard K. Tom. Retrieved 2008-12-16. ^ Dersch, John (January 19, 2019). "Introducing Darkstar: A Xerox Star Emulator". Living Computers: Museum + Labs. Archived from the original on January 20, 2019. Retrieved March 20, 2019. The Xerox "Star": A Retrospective.